Shop online for 2 aero-car model trains at discounts up to 20%. This is the Rail & Track Cleaner 8oz. Bottle from Aero-Car Technology. 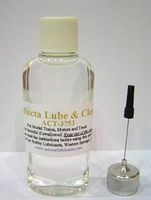 This is the Electrical Contact Lube & Cleaner 1oz. Bottle from Aero-Car Technology.